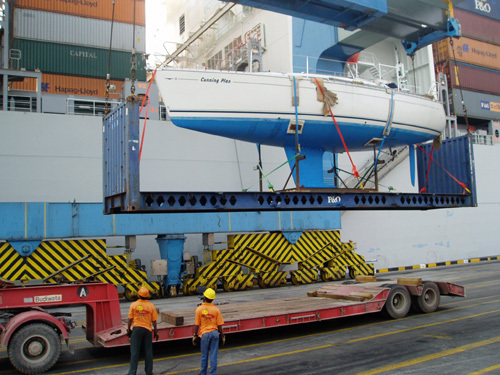 Nationwide, continental and worldwide transport of all craft. 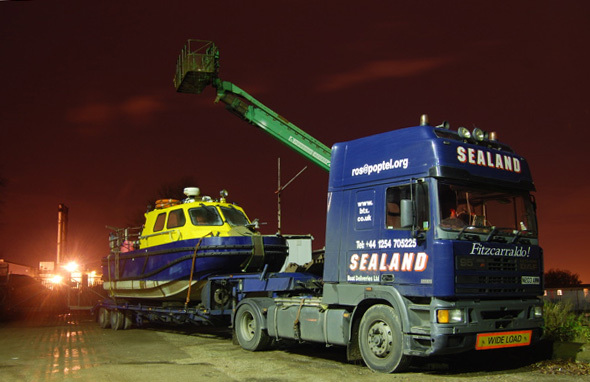 We extricate all craft, long, wide or high, using steerable trailers and trolleys. 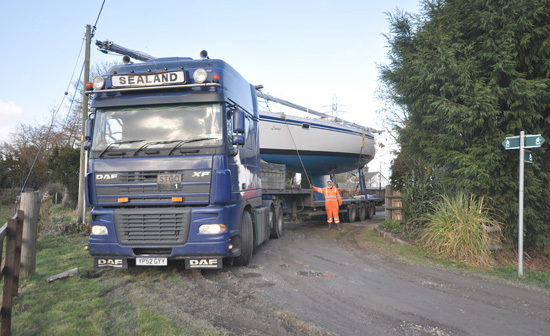 We unstep masts, transport by road and sea, lift, launch and re-rig all craft. 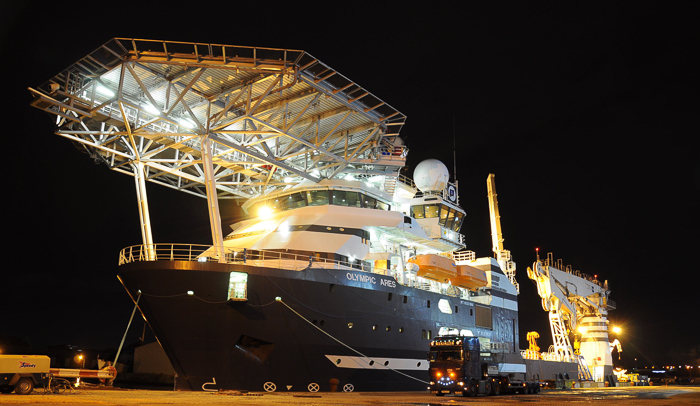 We support offshore research, exploration and construction. 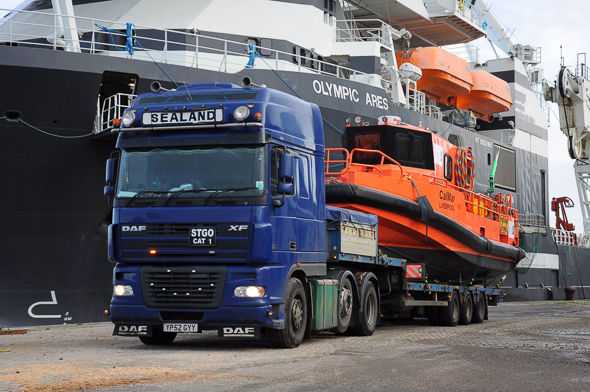 We deliver dive support craft on time-critical moves for offshore subsea operations. 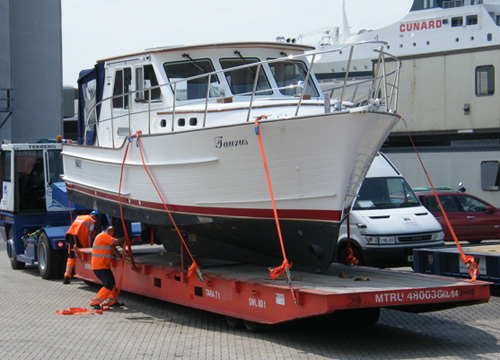 moving special boats and important yachts for our customers. 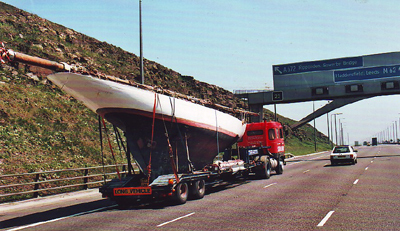 cross-country from Grimsby GB to Largs GB. 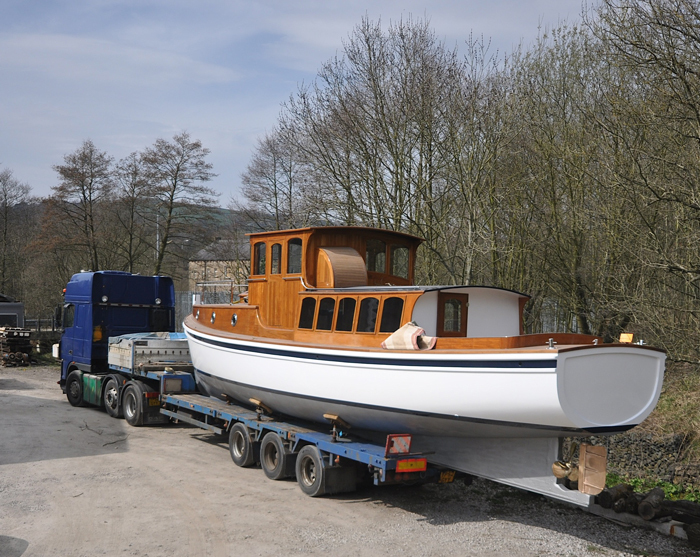 her return to France 70 years after rescuing soldiers from the beaches in 1940.
and launched the 18.0m vessel for restaurant service on the Liffey in Dublin IRL. BLOSSOM from Ireland to Australia. 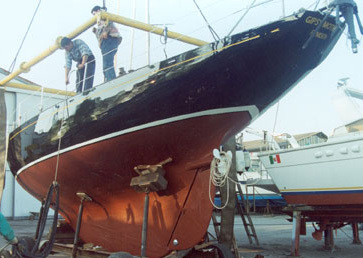 Almere NL to the Royal Selangor Yacht Club, Port Kelang, Malaysia in 2004.
after breakdown in the Caledonian Canal. Delivered by road and ship to Norway. 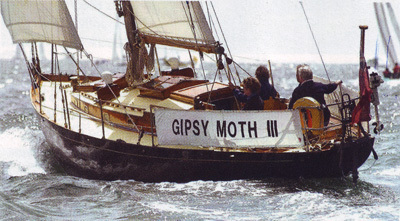 We rescued Francis Chichester's 1958 GIPSY MOTH III - unseaworthy in Gibraltar - hauled across the Sierra Nevada for restoration in North Wales GB. 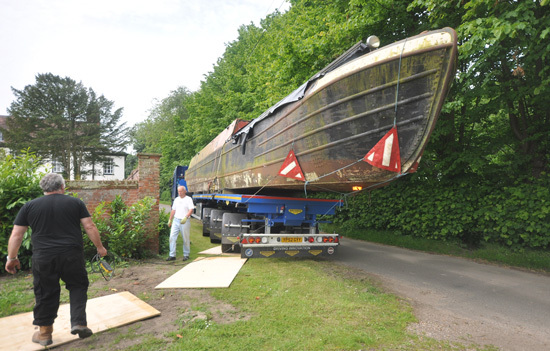 recovered the 8.3 m wooden sloop EGRETTA - impounded in the Corinth Canal, Greece - hauled home for repairs at her birthplace in Maldon, Essex, GB. 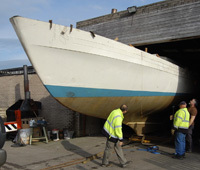 repatriated the 21.3m modern classic cold-moulded wooden sloop MADAM, dismasted in the Skagerrak, delivered by road trailer from Risor, Norway, to Levington, Suffolk, England. 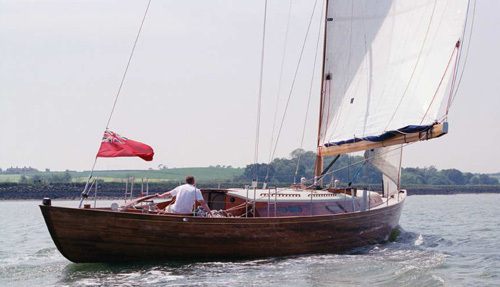 transported the restored Danish motor yacht OLIVIA from Estonia to Beaufort, South Carolina, USA, in 2003.
recovered, cradled and deliverered the Albin Vega sloop NUIT BLANCHE from Marseille-lés-Aubigny, France, to Melbourne, Australia, in January 2005.
rescued the stolen and stranded cruiser-racer BRIGAND OF MERSEY [Knud H. Reimers, Stockholm, 1955] - hauled from Barcelona E to Cheshire GB for refit. 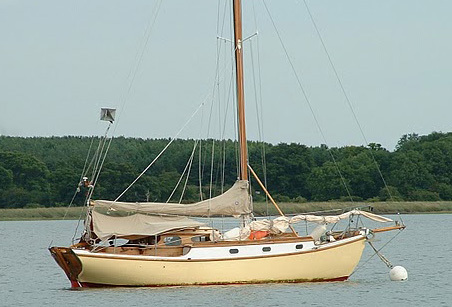 The unforgettable Dubber died accidentally on a retirement holiday in 2009. 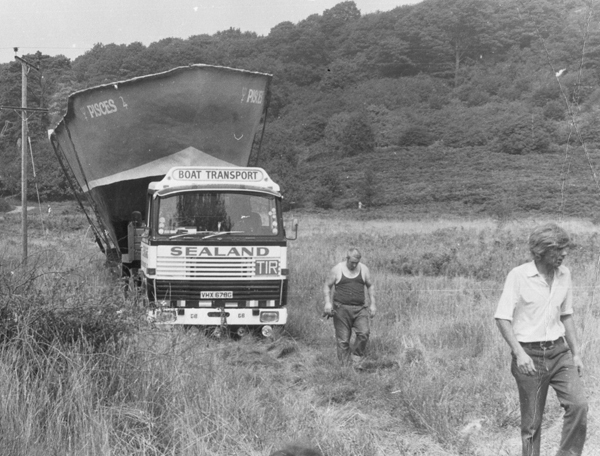 In this mid-seventies picture he paces out rough ground for colleague Norman Kay at the wheel of Scania 110 VHX678G. 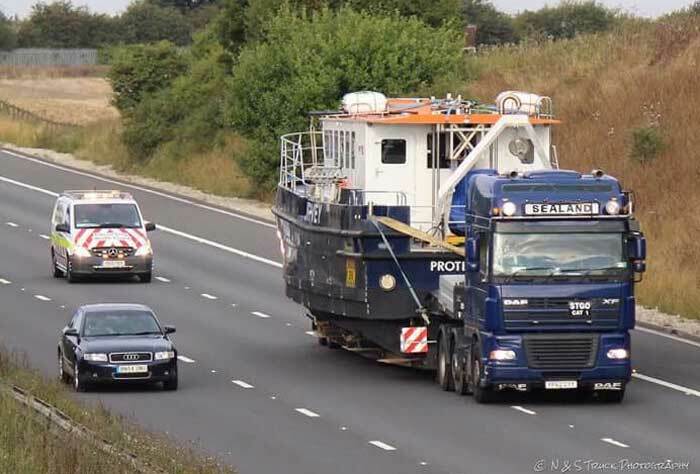 They are following the eccentric yacht builder Paddy Power across fields near Wolverhampton, to deliver his unusual PISCES 1 to Gloucester Docks. Dubber was irrepressible, ingenious, brave and resourceful, a great driver, a good debater and a damned good union man. We miss him. 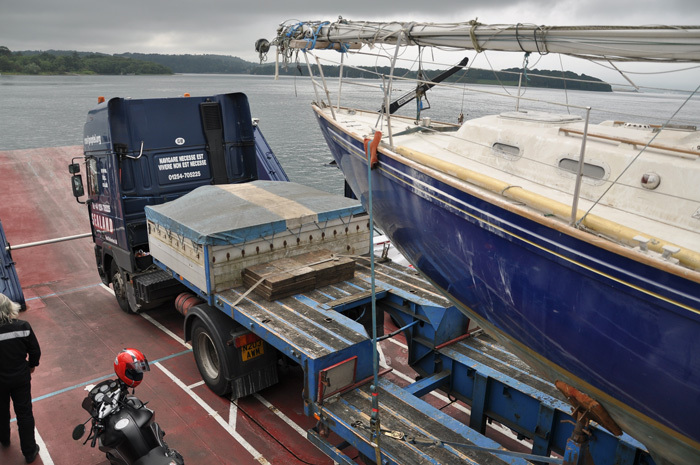 Receive a personal boat transport quotation by email.